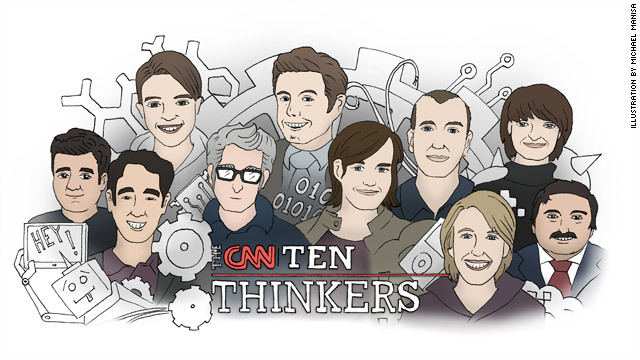 CNN Tech continued its yearlong look at innovation in tech and related fields by publishing The CNN 10: Thinkers, honoring 10 visionaries whose ideas are shaping our future. These creative minds have shoved conventional wisdom aside and are changing the world with their insights and innovations in 3-D printing, online education, big data and other areas. For more information about the individual lists and/or the series in general, follow @cnntech on Twitter or use the hashtag #cnnthinkers. The Thinkers project was developed and compiled by senior producer Brandon Griggs and writer/producers Doug Gross and Heather Kelly. It is also available on desktop and mobile at CNN.com/thinkers and in the Tech section of the CNN mobile apps for iPhone and iPad. The Thinkers list comes on the heels of The CNN 10: Startups, which recognized 10 young companies that are shaking up the tech industry. In November, CNN Tech will publish The CNN 10: Gadgets, a list of game-changing gadgets to watch. The series culminates in December with The CNN 10: Ideas, celebrating 2013’s boldest and most impactful thinking across tech, science and related fields.